The Internet of Things. The popularity of this topic seems to be growing just about as rapidly as as the amount of machine data generated by these “things” has. A few weeks back, our beloved co-founder and CTO, Christian Beedgen, penned an article, The Internet of Things: More Connectivity Can Mean More Vulnerability, where he discusses some of the security challenges that exist around the exponentially growing number of devices connected to the internet. Most major tech companies have written about or published infographics about IoT, yet when I read these articles or review infographics, they all seem to be missing a very obvious fact about the Internet...The Internet is made up of cats. 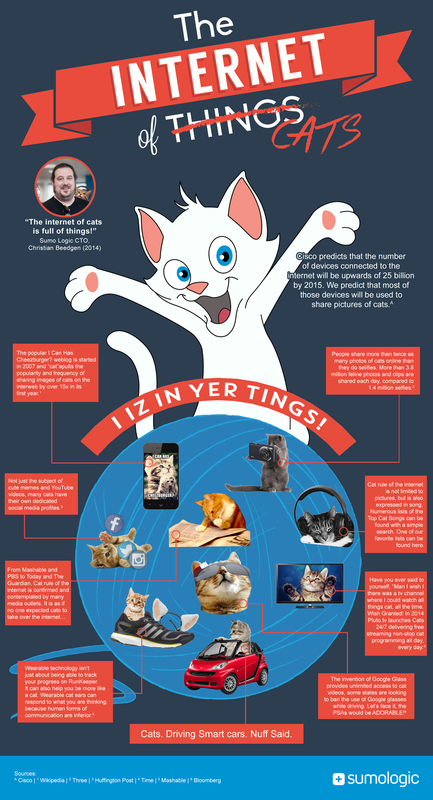 To highlight what's truly representative of our interconnectedness, we present you with an infographic around "The Internet of Cats." Enjoy! More posts by Jana Lass.